This morning I needed some inspiration and this story from the Oakland Press seemed to have done the trick for me. Many of our youth could learn a great lesson from Stephen Das aka “Cotton Candy Man” who spoke Longacre Elementary School students in Farmington Hills about giving back and inspiring others. Stephen Das really does have inspire me and his story, hopefully will inspire you as well. Teaching our children to give back is so powerful for their future lives that it cannot be measured but only inspired by people such as Stephen Das. 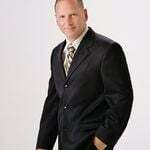 After reading this article I’m ready to start my day and of course as a Realtor, giving back as much as I can to my home buyers and home sellers, its a great take away to make it a great day and to inspire. 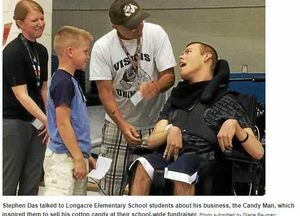 This year, Longacre Elementary School students were really moved by Visions student Stephen Das. Das has cerebral palsy and, with the help of technology, is able to communicate and operate adaptive equipment. He is enrolled in the Ability Awareness class this year. The emphasis of the class is on each student reaching his or her own potential,through music, art, poetry and biographical information. Das created his own enterprise called the Candy Man. Through social media and word of mouth, Das’ business has taken off. Fourth grader Justin DelPup was so deeply touched by Das’ presentation that, with the help of his teacher Angie Ritenour, they organized a school-wide fundraiser. For their annual Sharpen the Saw Day, students sold Das’ cotton candy instead of their usual popcorn.